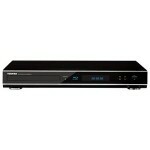 Former Blu-ray rival Toshiba has officially announced availability of two reasonably priced Blu-ray Disc players. The BDX2500 ($179.99) and BDX2700 ($249.99) include Wi-Fi, 7.1 channel audio, 24 frames-per-second, and compatibility with Netflix and Blockbuster On Demand. The main difference between the two players resides in wireless capability. The BDX2700 comes with built-in Wi-Fi but the BDX2500 will need an adapter. There are also slight design differences. 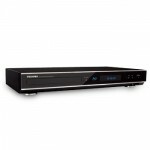 The more stylish BDX2700 features metallic-trimmed foot pedestals and a light-up Blu-ray logo. This isn’t the first time Toshiba released a standalone Blu-ray player. In September 2009 they shipped the BDX2000, a full HD 1080p player with BD-Live (Profile 2.0) and 24 fps.